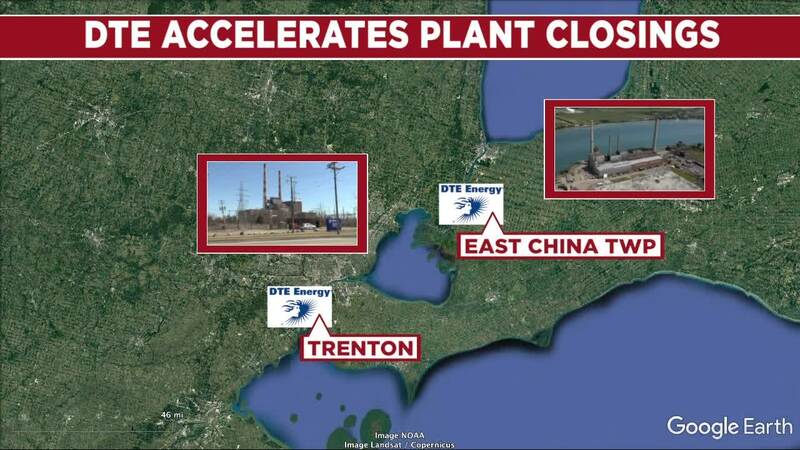 DTE Energy is preparing to move up the closure of multiple power plants in southeast Michigan, including plants in Trenton and East China Township. The move would speed up job transfers, and impact local communities — Trenton, for instance, is working to determine how they can avoid layoffs to city workers. 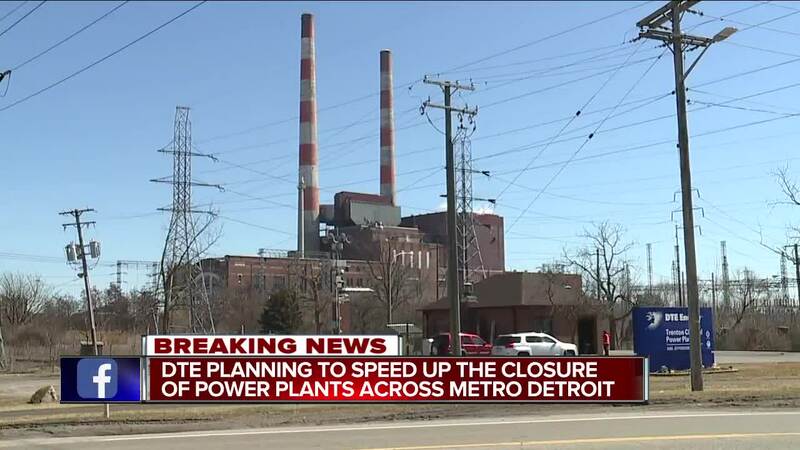 DTE is due to file a plan with the Michigan Public Service commission later this week that will describe timelines of the closures, but people familiar with the plan tell 7 Action News that they plan to move up several power plant closures as more renewable energy sources come online — late this afternoon DTE confirmed that they have plans to speed up the closure of both plants, contingent a natural gas-powered plant set to come online that same year. 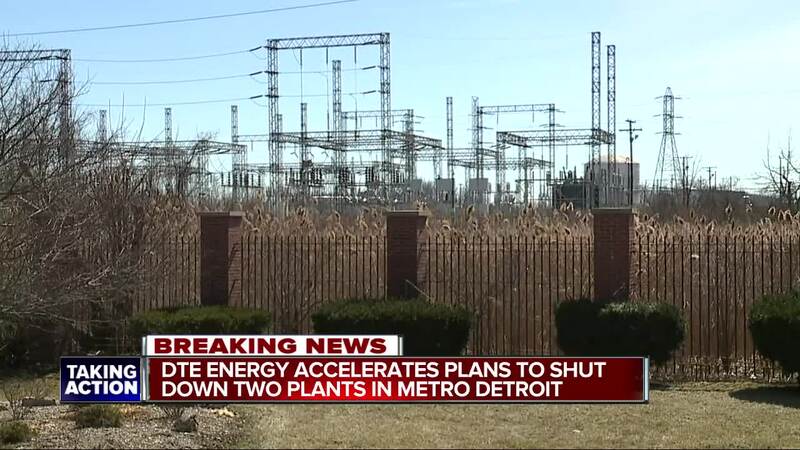 (WXYZ) — DTE Energy is preparing to move up the closure of multiple power plants in southeast Michigan, including plants in Trenton and East China Township. The move would speed up job transfers, and impact local communities — Trenton, for instance, is working to determine how they can avoid layoffs to city workers. DTE is due to file a plan with the Michigan Public Service commission later this week that will describe timelines of the closures, but people familiar with the plan tell 7 Action News that they plan to move up several power plant closures as more renewable energy sources come online — late this afternoon DTE confirmed that they have plans to speed up the closure of both plants, contingent a natural gas-powered plant set to come online that same year. Bohm, who has knowledge on DTE’s plans through his work in St. Clair County, told 7 Action News that the changing of the closure dates will hurt some communities worse than others. East China Township is also the home of DTE’s newest natural-gas power plant which is expected to come online in March 2022. That plant will offset losses in St. Clair County because employees will have the option to transfer jobs, but also the new plant will make up for the lost tax revenue to the county. Bohm estimated that DTE has a taxable revenue of nearly $828 million in their county alone. In communities like Trenton, DTE leaving early could be a much harder hit on the local community. The original plan was to take the Trenton Channel power plant offline in 2023, the goal is now to move the date up to 2022. While the community has already been working towards a plan to offset revenue loss, Mayor Kyle Stack admitted that the numbers are still a work in progress. Stack added that she’s hopeful that DTE will find a way to stay in the community in some form. "They’ve been a great partner in this community, I’d hate to see them leave — or totally leave," he said. The moves aren’t entirely surprising to those paying close attention to the industry, and they’re likely to be cheered by environmentalists hoping to see coal power plants shutdown. DTE has championed a plan that states they’ll be cutting their carbon footprint by 80 percent by 2050 — the baseline was their total carbon footprint in 2005. In the more immediate future DTE plans to reduce their carbon by 20 percent by 2020. Wind and solar costs have dropped so quickly that a report released earlier this week by Energy Innovation, a non-partisan think tank, indicated that 74-percent of the U.S. coal fleet could be faced out by renewable energy. A little more than two weeks ago DTE announced the commissioning of their largest wind park to date. “DTE was among the first energy companies in the nation to announce a broad sustainability initiative consistent with what scientists say is necessary to address climate change globally and do it in a way that maintains affordability and reliability for our customers,” said Gerry Anderson, chairman and CEO of DTE. The changing industry has been a hot-button issue not only within the industry, but on the political trail. President Donald Trump announced plans to reverse coal emission rules in 2018 to help the beleaguered coal industry — a move that would make it easier to open new coal plants, still many plants continue to be taken offline while Democrats debate the need for “Green New Deal” that would call on more renewable energy. Regardless of how the campaigning plays out, it appears more and more power companies are shifting their portfolios to renewable energy. Earlier this year General Motors partnered with DTE Energy to purchase 100-percent of it’s electricity needs for it’s the GM Tech Center in Warren, and it’s operations downtown inside the Renaissance Center. The good news for workers is that DTE is committed to keeping their workers. In a portion of the company’s statement, in reaction to 7 Action News’ reporting, the company said they are working closely with employees to ensure there are no layoffs — it’s also worth noting that employees were expecting the closures to occur in 2023, so some had already been making plans. Larry Simons, the East China Township supervisor, told 7 Action News he expects that employees will make out better than municipalities in terms of finding alternatives. Simons, a former DTE employee, noted that he went through layoffs while he was an employee, and that layoffs didn’t happen. Simons' office sits across the street from the St. Clair power plant that will now close in 2022 — the plant suffered a fire recently and he noted that it was strange when the plant turned offline. The prospect of it being permanent is hard to grasp, people in the community have grown up with the plants. Built in the 1950s, it was at one time the largest power plant in the world. Simons said the jobs will likely change over time too — a push for more renewable energy means a shift in jobs, but in the short-term he said with coal-plants in nearby communities will still need work. St. Clair has a second coal power plant in the county that will still run. One of DTE’s largest coal power plants, located in Monroe County, is also unlikely to be affects by the shifting closure schedule after a recent investment.